Describe the type of business purposes and ownership of two contrasting business, the two businesses I have chosen are The Post Office and Tesco. 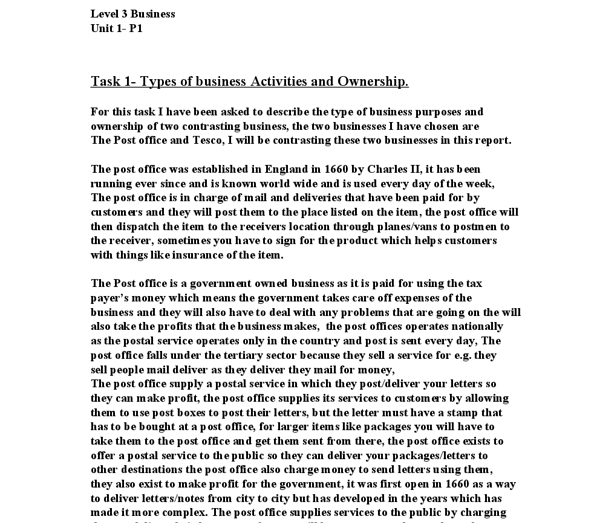 ﻿Level 3 Business Unit 1- P1 Task 1- Types of business Activities and Ownership. For this task I have been asked to describe the type of business purposes and ownership of two contrasting business, the two businesses I have chosen are The Post office and Tesco, I will be contrasting these two businesses in this report. The post office was established in England in 1660 by Charles II, it has been running ever since and is known world wide and is used every day of the week, The post office is in charge of mail and deliveries that have been paid for by customers and they will post them to the place listed on the item, the post office will then dispatch the item to the receivers location through planes/vans to postmen to the receiver, sometimes you have to sign for the product which helps customers with things like insurance of the item. 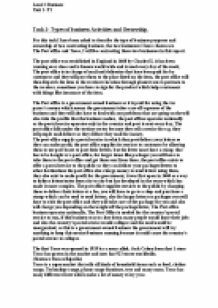 The Post office is a government owned business as it is paid for using the tax payer?s money which means the government takes care off expenses of the business and they will also have to deal with any problems that are ...read more. The post office supplies services to the public by charging them to deliver their letters at a fee, you will have to go to a shop and purchase a stamp which can be used to send letters, also for larger letters or packages you will have to visit the post office and they will take care of the package for you and also will charge you depending on the weight off the package/letter, The Post office business operates nationally, The Post Office is needed for the country?s postal service to run, if this business was to close down many people would loose their jobs and also the country?s postal service would collapse and the mail would be unorganized, as this is a government owned business the government will try anything to keep this service/business running because it could cause the country?s postal service to collapse. The first Tesco was opened in 1919 by a man called; Jack Cohen from that 1 store Tesco has grown in the market and now has 923 stores worldwide, (Sentence from wikipedia) ...read more. prices which customers can afford so it is easier to shop with them and so they can also make more money, Tesco was opened in 1919 as one store which has transformed into a Globally known business. They operate in different parts of the world but mostly in the U.K. Tesco supplies its services/products to customers by allowing them to come in store and buy the products that they need and when they are done they will go to a checkout to pay for them, Tesco exists to offer goods at reliable prices, for the public to buy, Tesco is well known for cheap products at suitable prices that people can afford, it has also uses advertising and is on price comparisons sites to show how cheap they are. If Tesco was to close down a lot of people would loose their jobs, but it wouldn?t affect customers as much as if the post office closed down, because there are many other supermarkets which the customers could change to, there are other supermarkets like, Asda, Morrison?s, Sainsbury?s and many others we?re people could shop instead of Tesco so it wouldn?t affect the government/customers that much. ...read more. complaints and respond to hazard warnings regarding defective products should be investigated * Promote consumer awareness; in order to assist in the reduction of accidents particularly with safety in the home. 4. Pollution Control Objective: To contribute to the protection and improvement of the environment by regulating air and noise pollution. I think this is a very effective way of making maximum profit in minimum time! I will analyse each aspect of marketing and I will explain how business advertising agencies can do it effectively. BUSINESS DEVELOPMENT Business development never relies purely on sales ability nor does it depend on spending vast financial resources on advertising and printing of company brochures. Their customers buy products from marks and Spencer's to benefit themselves and therefore Marks and Spencer's are making a profit. The suppliers of Marks and Spencer are the firms in the business environment that sell their goods to marks and Spencer benefiting both parties involved. Availability Availability of substitutes influences demands when substitutes are high so demands will be lowered, but if the substitutes are low the demands will increase. Level of gross domestic GPD If Level of gross domestic products is decreased, it influences the demands will increase for more products. Some strategies will only be communicated to certain people at certain times using a range of communication techniques SWOT analysis: They undertake a regular a swot analysis and the report that is produced is then presented to managers to see what is going on and it can be related to SWOT analysis. Although it is more expensive the value of it is more worth it as you are getting more for your money. In addition there are a lot of buy one get one free product and ASDA made products that appeal to the customers.